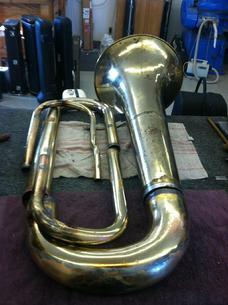 The wreckage of this Yamaha 321 tuba was brought in by a band director at a local school. Several other repair shops looked at it and decided it was not worth fixing. 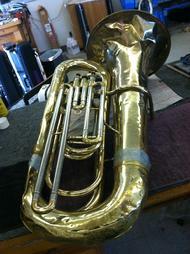 As a tuba player, I looked at it and saw a challenge. 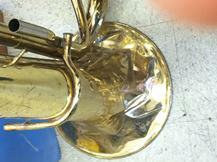 The biggest problem was several large cracks in the large branches of the horn and the bell. 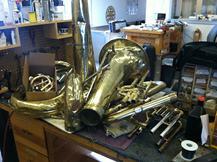 As it happens, we had a 3 valve version, the Yamaha 201, of this horn sitting in the shop collecting dust. 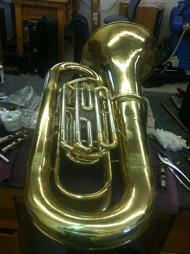 The valve cluster was shot on ours, and the large bows were dented, too, but at least they were not cracked. 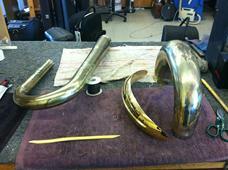 So, we determined the best way to fix it would be to combine the salvageable parts from both horns. 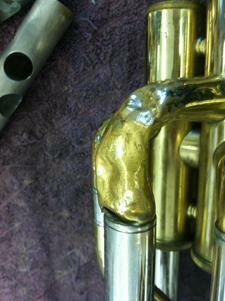 Dent removal is a fairly straightforward process when the horn is broken all the way down. My favorite tool for this is the dent magnets. Check out this youtube demonstration of the magnetic dent removal system. The more challenging part was replacing one of the knuckles on the third valve. 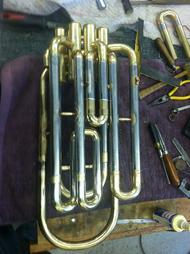 The original was completely shot, so I actually sawed the corresponding knuckle off of the donor horn, created a ferrule out of spare tubing, and soldered it into place. I also cut the long third slide tube, which is damage prone, and installed a new third slide. I had to remove the bow guards to facilitate dent removal on the bottom and top bows. It is usually far easier to replace the old bow guards with new ones. I wired the new bow guards into place, buffed them, and Merlin sprayed on a new coat of lacquer. 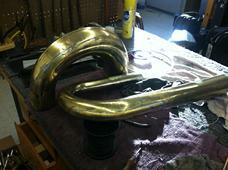 With the dents removed, I first soldered the bell section back together. After that, I fit the new valve section in and rebuilt the bracing. 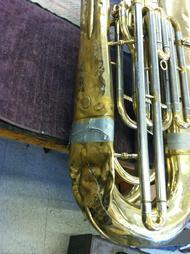 A horn that is damaged this badly takes quite a bit of adjustment before it will fit together. 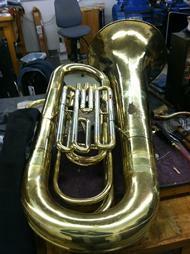 The end result, though, is a very useable horn for far less than the cost of a new one. Thank you for visiting merlingrady.com!